Innovation by the three top food companies keeps yogurt atop IRI's annual New Product Pacesetters. Consumers are still hungry for new products, despite a challenging economic environment. Making new products stand out from more than 40,000 items in the supermarket and many more items in larger-format stores is no walk in the park. But stealth marketers are winning this and other challenges, according to the annual New Product Pacesetters report from Chicago-based IRI. Announced April 21 during the IRI Summit conference in Austin, Tex., the New Product Pacesetters uncover the latest, most innovative ways to build growth in the consumer packaged goods industry (CPG). On average, 2014's Pacesetters earned $34.8 million. Yet Kraft Foods’ Lunchables Uploaded meal kit took the highest ranking in IRI's Pacesetters report, as the best performing new product, based on year-one sales, with $143.2 million. Though meal kits are popular, yogurt may actually be the big news this year. Chobani, which entered the Greek yogurt segment a few years ago with its flagship Chobani brand, cranked up its share of sales with two 2014 Pacesetter brands: Chobani Flip and Chobani Simply 100. These new brands earned Chobani an extra 1.3 yogurt dollar share points worth more than $184 million, said the IRI report. In addition to issuing its Pacesetters, IRI also announced its Rising Stars for 2014/2015, which are new products currently performing well within the year-one launch timeframe. In the 2014 Pacesetters report, IRI observed that 17 percent of consumers are new-product enthusiasts, and they still like to indulge at home and avoid paying restaurant prices. Growth increased moderately for U.S. CPGs in 2014. There are many new product developments, yet marketers who fail to lead the way or don't create something quickly enough will be pushed right off the store shelf, said Susan Viamari, report author and IRI's editor of thought leadership. "Those that succeed create a sales and revenue splash, start a buzz, garner market share and drive outsized growth," she notes. These are products launched during 2014 that did not complete a full year of sales but already are being tracked as likely Pacesetters for next year. Thousands of new brands hit store shelves annually, yet only 200 achieve best-of-the-best IRI Pacesetter status. Products must gain attention by satisfying crucial needs and wants, Viamari says. "They must bring value in a concise, clear format that breaks through the clutter and attracts target shoppers." Gaining a better understanding and applying these insights to current and emerging shopper trends, such as the move to healthier eating, can translate to enormous revenue and market share gain opportunities. This year, more new brands have been launched in the food category than in the beverage sector, which Viamari believes is driven by the continual changes in consumer palates and food pangs. Also in 2014, 53 percent of new brand entries came from the food and beverage aisles of the store (IRI also tracks non-food CPGs). 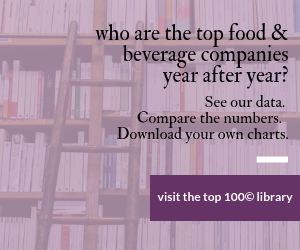 On average, new food brands brought more sizable year-one sales in 2014 (year one means the product must complete a full year of sales in the 2014 calendar year, for example). And 15 percent of Pacesetting brands were new brand rollouts. Nearly four out of 10 top-selling product launches in 2014 were more powerful, more delicious and more rewarding in some way. That's not exactly new, however, Viamari points out, but it keeps picking up steam. "Consumers have come to expect great things from packaged goods, and CPG marketers are delivering in spades," she says. Greek yogurt is still a favorite breakfast or snack, and it found its way into the Top 10 Food & Beverage Pacesetters list four times this year. There are a few brands in this sector pushing the envelope – in addition to Chobani's two, Dannon's Activia Greek and General Mills' Yoplait Greek Blended also made the list. Beverages need to be truly new and different. Alcoholic beverages are extending beyond the norm with more targeted spins. In the beer category, for example, the apple-crisp Redd's Apple Ale from MillerCoors is brewed like an ale, but has the tart bite of an apple. It was the largest of the launches, capitalizing on the search for trendy alternatives to conventional beer. Anheuser-Busch had a Top 10 launch for the third year in a row, with its Bud Light Lime line extension Straw-Ber-Rita, which the report says aims to broaden its market reach. MillerCoors in fact ranked three Pacesetter launches for the year. Redd's Apple Ale made the Top 10 list, and its companion Strawberry Ale also made the 100 products IRI identifies as the larger Pacesetters list. Third Shift, another MillerCoors product, came in at No. 82. IRI has been tracking the most powerful brand launches in consumer packaged goods (CPGs) for a number of years. To be considered for Pacesetters, the product must complete a full year of sales in calendar year 2014. IRI starts tracking year-one sales after a product reaches 30 percent of national distribution across multi-outlet geography. This means grocery, drug, mass, dollar stores, club and convenience store channels. Convenience still counts. Key benefits of the top brands include fewer ingredients, simplified ingredients, convenience and a simplified design, she says. "Nearly one-third of today's most powerful new products make life easier for consumers." Bite-sized and hand-held sandwiches are easy-to-eat examples across the CPG aisle, while Pacesetter Chobani Flips (creamy Greek yogurt and crunchy toppings) is a portable way to satisfy a snack craving. Dole's Chopped Salad Kits and Oscar Mayer Deli Fresh Bold luncheon meats − both 2014 Rising Stars − make it easy for time-starved consumers to conveniently and quickly fuel up. Clean labels and simpler formulations factor prominently in what consumers expect from their favorite CPG brands because they reap loyalty and sales, Viamari notes. SkinnyPop popcorn, which is labeled "no artificial anything," is one of the many clean-label foods grabbing a greater part of the market with a simpler ingredients list. Fewer ingredients and/or more natural ingredients are seeing plenty of sales energy. Nearly half of consumers (42 percent) eat at home more now than when the economic downturn began, mainly to cut costs. Restaurant- and cafe-inspired food and beverage brand introductions can help. Brands like Chili's At Home multi-serve frozen dinners/entrees (a 2015 Rising Star) and DiGiorno Pizzeria! -- a Top 10 Pacesetter with a flavorful sauce, premium toppings and a crispy crust -- can transform a dull, at-home meal into a quick and easy treat in minutes. Such small indulgences add excitement to a monotonous, busy week, and despite being short on cash and time, consumers look forward to them in their everyday lives. Breyers Gelato Indulgences (a 2015 Rising Star) teams ice cream, sherbet and delectable toppings for a trio of textures. It takes only a few York Minis mint-chocolate candies (another Rising Star) to calm a sweet tooth. And Chobani Simply100 yogurt tastes luxurious, but has a mere 100 calories, no GMOs, 2g of protein, 5g of fiber and zero fat. These benefits have to come at the right price, Viamari cautions. "The best value doesn't always come cheap," she said, but "almost half of consumers (48 percent) stated their interest and awareness of new products is heavily influenced by price." Likewise price can affect whether consumers will try new products. "Trial is ultimately driven by a number of factors, which differ across and within CPG categories," she says. Many of 2014's top-selling new products commanded sizable premiums in average price paid, such as SkinnyPop (which sold at a 72-percent higher price than the category average) and Red Bull Editions (68 percent higher). The latter is a Top 10 Pacesetter in the Convenience Store category and extends the Red Bull energy drink lineup with five fruity new flavors, two of which have zero calories. How do brands command sizable premiums in price? By addressing assorted consumer needs and wants for a healthy, quality, portable products with plenty of flavor variety. Oddly enough, in the Convenience Store category, three of the Top 10 Pacesetters were cigarette-related; one was an electronic cigarette, but the other two were real cigarettes. "These winners are catering to consumers' rapidly evolving notions of indulgence and excitement," the report indicates. With three-quarters of new product introductions earning less than $40 million in their first year, knowing where to be and being there are equally key to ensuring success. "With so many choices in the marketplace, the odds of consumers going on a hunt for a new product for the first time are slim," the Pacesetters report notes. Marketers need to study trial and repeat purchase behavior, Viamari says, naming a few marketing touchpoints many of the top 10 products had in common: "Keep things simple; bring new and exciting experiences to consumers; provide good value and excellence; and make sure the price is right."